TMI-Orion will help you find the best solution for measuring all the physical parameters you are dealing with in your processes: Steam sterilization, EtO sterilization, Depyrogenation, Freeze drying, Temperature monitoring ... Data processing software will assist you for a better process quality management in compliance with the norms FDA 21 CFR Part 11. TMI-Orion has a solution for each one of those parameters in accordance with the need of each process. Multi sensor data loggers with numerous probe combinations give a cost effective advantage for increasing the number of measurement points. PicoVACQ Temperature is a series of models offering a wide variety of temperature probes. The smallest, PicoVACQ 1T, diameter 15 mm and height 22 mm, has an internal probe. PicoVACQ 1Tc can be manufactured with different probe sizes, diameter 3 mm and length up to 100 mm. The PicoVACQ 1Td has a semi-rigid stainless steel probe or a flexible probe, diameter 2 mm, length up to 1000 mm. This model, associated with a thermal shield, is very well appreciated for depyrogenation processes. A disconnectable probe version is also available: PicoVACQ 1Tdi. All these models can operate up to 150°C and they are watertight. They can be immersed or used in steam environment. Their dimensions may vary with temperature range and type of probes. The PicoVACQ PT is a pressure and tempeature data logger, from 0°C to 140°C and up to 15 bar. With its tiny dimensions, diameter 16 mm and length 35 mm, it can be placed in sprays or very small containers. It is also used in steam sterilization applications. The NanoVACQ Temperature is a watertight under pressure data logger, made of 316 L stainless steel with Platinum sensor technology (Pt100 or Pt1000). Its ruggedness allows temperature measurement in harsh industrial environments. The various models answer most industrial needs, they vary with the type and number of probes, the temperature operating range and battery capacity. FullRadio is available for all the models. The NanoVACQ Temperature (Diameter 31 mm and height from 31 mm to 132 mm) is available with 1, 2 or 3 temperature probes. Most models are water tight. The models NanoVACQ 1Tc-2Td and the disconnectable probe version NanoVACQ 1Tc-2Tdi are very well adapted for freeze drying process. The NanoVACQ Flat is a single temperature data logger. The temperature probe can be internal or have various sizes up to 100 mm. Its small size, diameter 40 mm and height 11 mm, makes it suitable for washing processes or any sterilization process. The NanoVACQ Pressure and Temperature is a series of data loggers able to measure pressure and temperature inside autoclaves. 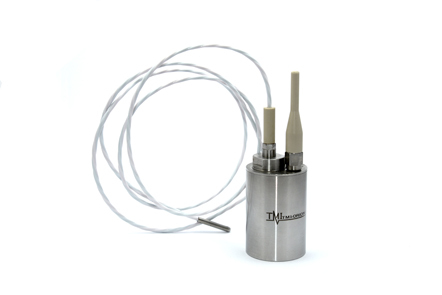 For the most accurate data during transients, the NanoVACQ PT-Tc with a thin hybrid diameter probe is recommended. 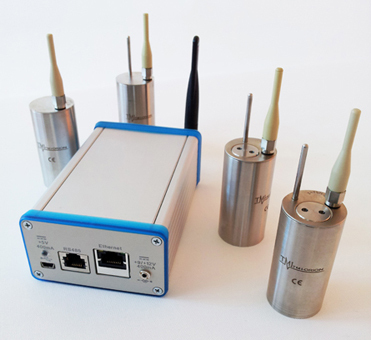 Associated with some NanoVACQ 1Tc , the group of data loggers constitute a complete validation system. Semi-rigid or flexible probes are also available instead of a rigid probe, NanoVACQ PT-Td. NanoVACQ HT has one humidity sensor and one or two temperature sensors. It is available in Ex version, which makes it suitable for Ethylen oxyde sterilization validation. PicoVACQ HT has one humidity sensor and one internal temperature sensor. It is available in Ex version for applications in explosive environment, such as Ethylene oxyde sterilization validation. MiniVACQ is adapted to thermal processes from -40°C to +100°C. It is an ideal temperature data logger for washing-desinfection processes. VACQ xFlat is a thermocouple data logger. It can be used for steam sterilization validation. In this application the data logger is placed outside the autoclave. It can also be used inside depyrogenation process (dry heat) where the data logger is protected by a thermal shield. The VACQ XFlat is available in 4, 8 or 16 thermocouples version. (Dimension of model VACQ x1.4: 82x107x11 mm). The FullRadio option enables set up and reading of data in real time and wireless, by bi-directional radio transmission. It is then possible to start and stop the data logger while it stays inside the industrial process. FullRadio is adapted to sterilization process validation . Qlever is the software platform dedicated to the management of one or several TMI-Orion data loggers. It operates alone or in combination with one or several industry specific software modules. It enables set up and programming of TMI-Orion equipment, collection, processing, analysis and display of data. This module meets the requirements of the pharmaceutical industry. It is dedicated to all thermal cycle anaysis. Creation of an extensive measurement report with statistical calculations detailed by cycles and steps. Dedicated to TMI-Orion temperature and humidity loggers calibration process: calibration, adjustment, checking and editing of a report. Expert mode, automatic mode and Manual mode available. For analysis and validation of humid heat sterilization cycles and vacuum test. Data processing and validation in an extensive validation report in compliance with ISO 17665 / EN 13060 / EN 554 / EN 285. Intended for the analysis and validation of washing-disinfection cycles. Data processing and presentation in an extensive validation report in compliance with ISO 15883. Intended for climatic and thermostatic chambers (or any kind of thermal regulation devices such as rooms, ovens, autoclaves...) characterization and checking of temperature and humidity. Data processing and presentation in an extensive compliance report with FDX 15-140 / IEC 60068.3.11. For any application at a temperature higher than 150°C it is necessary to protect the data logger with a thermal shield.